Albuquerque has hot air balloons, Santa Fe burns Old Man Gloom, and Deming has its ducks. Since 1980, Deming has hosted the annual Great American Duck Race. The 39th edition of the event will be held Aug. 23-26 at the McKinley Duck Downs at Courthouse Park in Deming. 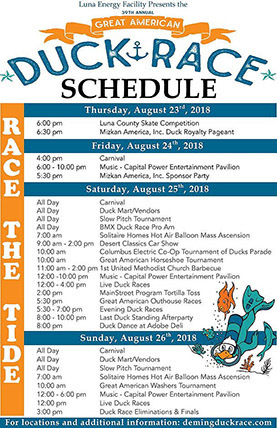 The Great American Duck Race, presented by Luna Energy Facility, features our favorite waterfowl racing but also includes the Columbus Electric Co-op Tournament of Ducks Parade, the Mizkan America Inc. Duck Royalty Pageant, the Solitaire Homes Hot Air Balloon Rally and the Deming Main Street Tortilla Toss. There also will be arts and crafts, food vendors, entertainment and the St. Clair Winery Beer and Wine Garden. While duck racing may be serious business to some competitors, the key word for the weekend of duck racing is fun. For instance, in order to become Duck Royalty, participants will be judged not only on their costume, but their knowledge of water fowl and ability to “waddle” and a two- to four-minute routine designed to “impress the judges.” The winners, of course, will become the Duck King and Queen. And if you are new to the sport of duck racing, don’t worry. There will be plenty of ducks on hand and a team of volunteers will help you choose a duck racer you can call your own for the event. Obviously, there will be prizes for all the competitive events, but unlike most sporting events, the fun is in the participation. For more information, call 575-567-1469 or visit www.demingduckrace.com.